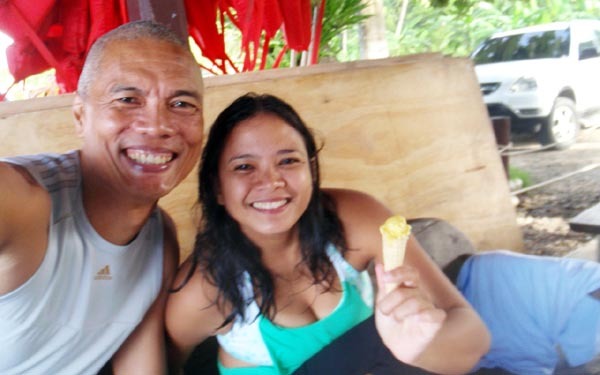 As good fortune would have it, I was again tagged along by the nice folks of Punta Bilar Dive Center to join them for a dive. 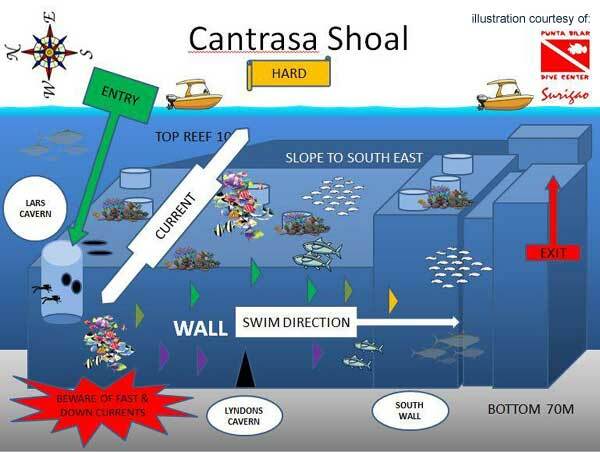 This time, it's the Cantrasa Shoal, just off Punta Bilar's shoreline. But here's the deal - the current is strong. 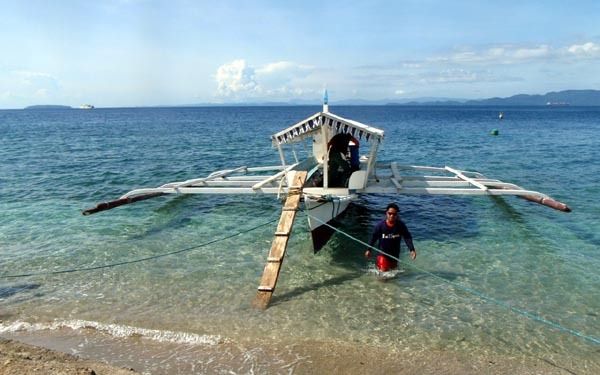 I've heard of horrifying tales about Surigao's current - it can pull the regulator off your mouth and rip your mask off! It has shamed many experienced divers. First time I heard it, I was excited and at the same time fearful to give it a try. Now that I'm faced with it, I feel butterflies in my stomach. We were to hang on to the rope connected to the anchor line and jump, pulling ourselves down. Zati jumped ahead of me, but due to a misunderstanding with the boatman, she jumped on the other side of the boat - there was no anchor line to hang-on to! Immediately, the current grabbed hold of her and pulled her out, like quicksand sucking you in. From the boat, the crew, Jeanne and everyone else were quick to grab her by the regulator before she drifted off. It was a harrowing ordeal until she was safely pulled back into the boat - sigh of relief to everyone, specially Zati who was left shaken. She opted not to dive anymore that day - good call. That episode was one for the books. The thing is, after Zati, it was my turn to make the jump. Yeah, right! I started reliving a mountain bike episode back in the day when I was next in line to make a big-air jump. The guy in front of me took his turn, over-compensated and landed on his tailbone and writhed in pain - no one wanted to be next after that. Now, looking at the water, I wanted to tuck my tail between my legs and come up with a plausible bailout...headache? toothache? LBM? I would have tried all the excuses but there was no fig leaf to be found. "Forced to Good", I grabbed the rope and jumped, pulling myself down the anchor line. Yes, the current was quick to call my attention. I could feel my mask loosening - I had to press it against my face. When I let go of the rope, the current took control. I finned against it, but I was still being pulled. Someone should have taken a shot of the horrified look on my face. Not seeing anyone, I clung to the coral wall - with no gloves. At that point, my breathing was shallow and fast, and I was probably pale with a near-panic look in my eyes. I was afraid I'd use up my air too fast. What the f#$@ did I get myself into this time? Clint appeared from the shadows and gestured me to follow him. Whew! Seeing him was like a new lease on life. Now I know how Moses felt when he saw the Burning Brush on that mountain top. Salvation was at hand! At some point, I lost sight of Clint but there was Jeanne. Confidence was back with her around. As we continued our dive, the current felt less and less until it felt normal - I could maintain bouyancy while staying on one spot. The whole time, I thought the dive would be under torrential current conditions! That ordeal was quite something. I got scared despite managed expectations. But what I went through is not nearly as extreme as some of the stories I've heard. That current only loosened my face mask. It didn't rip it off. I didn't feel my mouthpiece (primary second stage) being pulled from my mouth. But I'd been told of such extreme diving conditions when divers would even employ a commando crawl on the ocean floor to weather the current. 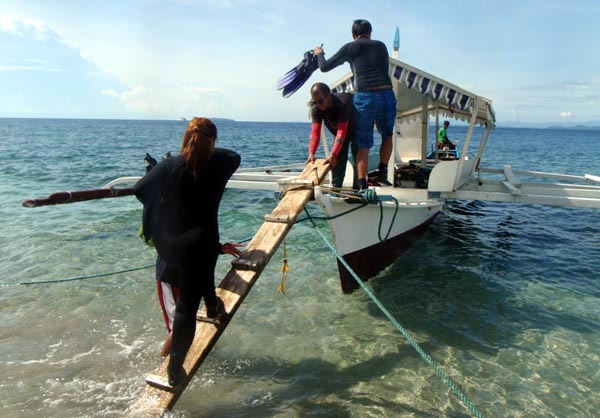 I'll leave that part to the intrepid divers of Surigao. For now, this experience is plenty for me. 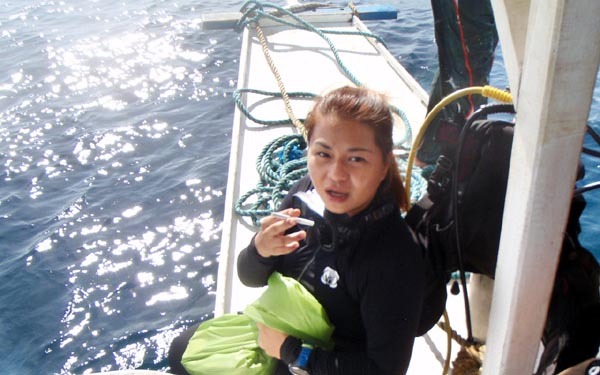 Diving Surigao's semi-strong current...check! Many many thanks to Jeanne, Zati, Marlon, Clint and Anna for a dive worth retelling to my future grandkids! ps - If you want me to objectively review a diving gear or cover a dive for your dive shop for this website (scuba gear, party boat dive, wreck dive, snorkeling, etc. ), email me. 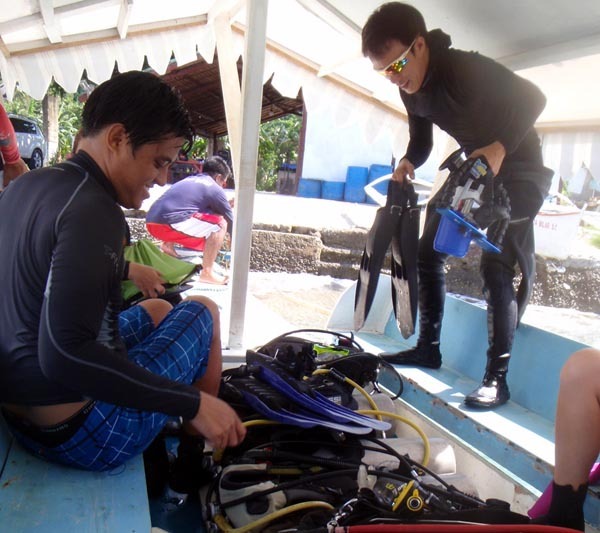 Surigao divers are strong divers, able to swim against currents that shame the most experienced divers. 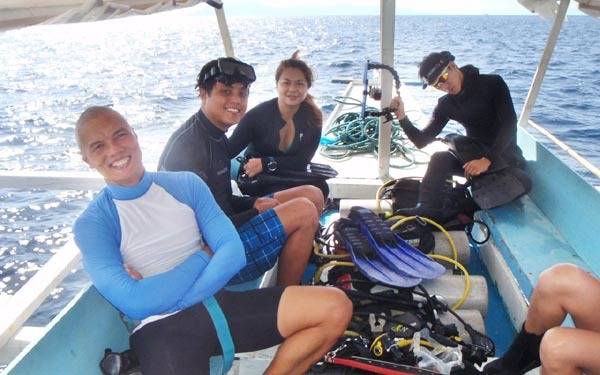 Some divers at Punta Bilar Dive Center are among the country's most adept cave divers. 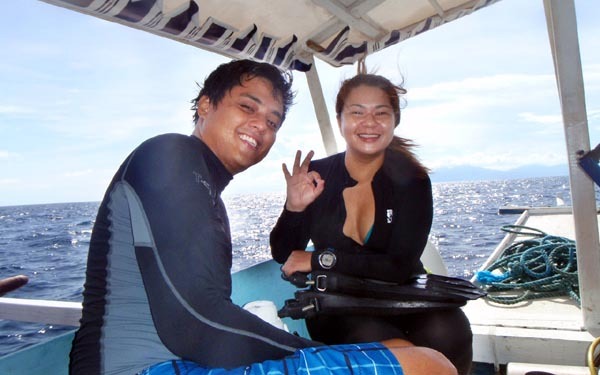 Read: You're in good hands with Punta Bilar Dive Center folks!